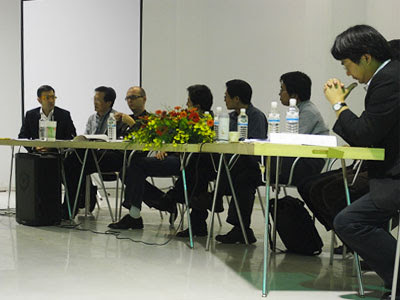 Transcript of Marjan Colletti's concluding statement ofthe marcosandmarjan workshop at Tunghai University, the Conference at the TADA Taiwan Centre for Art, Design and Architecture, Taichung Taiwan (09.04.08). 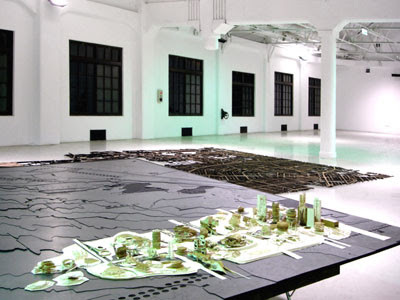 The Journal Architectural Dimensions >> – Journal of Design & Theory, Taiwan. The purpose of the [marcosandmarjan-Tunghai University] workshop was to launch a general debate on the potential and fundamental role of the Shuinan airport area in the future development of Taichung. As this large area was recently acquired by the local authority, this land’s future expansion should be open to the public. As it offers a unique opportunity for the city to engage the population in the decision making for this area, this event too should allow the visitors to express their views on the workshop’s proposal, and, most of all, state their opinions about the development of the area as a whole. Hence a blog is being launched in which also your opinions will be gathered (http://tw.myblog.yahoo.com/taichung-expo). On a particular area of the site we proposed an international Exhibition (Taichung-EXPO 2015) with the theme DESIGN & IDENTITY. The Expo is thought to promote the potential role of Taiwan as a leading centre of design in Asia, as well as regenerate part of the previous airport area with a series of public buildings/infrastructures that reinforce the cultural strength and identity of Taichung. In conversations, more and more students voiced their opinions on site and program, and we came to the conclusion that this Expo should be used by the most successful and representative Taiwanese industries as a window to the world showing their research and visions of the future - consequently, the Expo would to a large extend be sponsored by these industries, instead of spending large public funds as in other similar events. Also, each proposed building has two programs, one for the Expo period and the other suggesting the forthcoming use after the Expo, such as research facilities for the local universities, an ecological centre, several exhibition spaces, a multipurpose hall, housing, and entertainment. More importantly, ambiguity is an intrinsic element to the ever changing morphology of the discipline of architecture: what we are as architects, and what architecture is as a profession, are key factors to consider. I truly believe that ambiguity, blurriness, softness, convolution, are key to the development of the discipline. What I mean is that contemporary urban and architectural problems can only be addressed by an adaptive, flexible, mutable 'discipline' of architecture; and here I mean both the training/teaching, as well as the rigour that comes with it. This is what a pedagogic curriculum is about: the definition and adaptation of what 'discipline' is and how it can be taught. Surely we have tried here, with the workshop students and all the supporting local teaching staff (by the way a big thank you to you) to initiate debate on these issues. By the way, I have observed that many students did not have any digital skills when they started the workshop, but that they quickly learned how to manoeuvre around CAD programs in order to catch up with some of their more computer-literate colleagues. This is, on the one hand, good: it means that students here are as eager and talented as anywhere else. 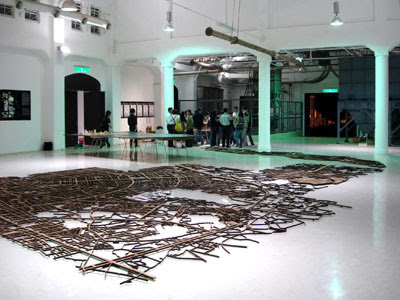 On the other hand, I find it curious, to say the least, that Taiwan - a major protagonist in developing digital technologies, and as we have heard also eager to become the design centre of Asia - does not pursue with more intensity, and discipline..., digital design and digital theory. You have the industry, the creative people, the talent, the skills; but somehow that seems not to be enough to produce an adequate environment for state of the art academic digital infrastructures - the labs, the workshops, the machines - and a digital curriculum - courses, research programs, knowledge transfer. If not here, where else? I wonder: how come the industry is further ahead than academia? Why in this country? Why almost everywhere actually? ...But back to the inside-out approach already mentioned, which deployed a multiplicity of individual starting points which were then extrapolated into a larger scale. In a sense, the process combined two development trajectories. On the one hand, it consisted in the rigorous coming to terms with ambiguity towards control: extrapolating individual observations towards a common strategic agenda and social proposal. In other words: from one towards many. This is a general attitude that I, we, firmly believe in. On the other hand, the urban and social implications of the project and the site demanded an opposite trajectory, i.e. from many to one. All the many initial considerations and languages had to be brought together into a single proposal, which you can see materialised in the final laser cut model. This process of interpolation is included in the term I often use: 'Convolution', which I have explained in my two lectures. In urban terms, I believe that digital (but not only) convolution can provide an alternative to what is usually pursued as parametricism, by which urban values are achieved by starting from, for example, geometric singularity and extrapolated into multiplicity/modulations/ambiguity via parametric cohesion. What I identify as 'Urban Convolution' on the other hand, starts from multiplicity/modulations/ambiguity and works towards singularity of language via convoluted cohesion. This process of interpolation, I prefer intrapolation (as opposed to extrapolation), was achieved during this workshop through 1) our architectural and urban master planning - but yes we reserved the right to overrule individual decisions..., 2) the 2D and 3D CAD techniques, and 3) the digital fabrication and manufacturing technologies, i.e. laser cutting.